Hemisphere GPS has announced an OEM alliance with a Chinese manufacturer of agricultural, construction, and power machinery equipment as well as the release of two compact GPS compass products. The Calgary, Alberta, Canada–based company’s alliance with YTO Group Corporation, headquartered in Luoyang City, China, is part of Hemisphere GPS’s to expand its operations in the international realm. YTO is now complementing its farm machinery product line with Hemisphere GPS’s Outback guidance systems, GPS, and the eDriveX system that automatically steers YTO’s farm machinery to a reported centimeter-level accuracy. Founded in 1955 and recognized as the birthplace of the first tractor in China in 1958, YTO has recently been awarded a number of units in a tender in Heilongjiang province in northeastern China. Luoyang is located south of Beijing in Henan Province. Hemisphere GPS recently displayed the Outback Guidance products on YTO’s new and largest tractor, model YTO-LA2004, at the Information and Modern Agriculture Exposition (IMAE2010) in Beijing. Meanwhile, Hemisphere has also launched its V102 single-enclosure GPS compass and the associated H102 OEM module. The products are designed for uses that require heading and positioning in marine and land-based applications such as yacht navigation, and auto-pilot and machine guidance for earthmoving machinery. Based on Hemisphere GPS’s Crescent Vector II and COAST technologies, the V102 and H102 provide 0.75 degree heading accuracy and one-meter positioning accuracy, according to the company, while supporting the NMEA 0183 communications format. In addition, H102 supports the NMEA 2000 standardized data communication bus. 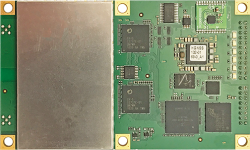 The H102 integrates two GPS antennas, a CANBUS communications processor, a single axis gyro, tilt sensors and a power supply into a single module that measures 37.5 x 10.5 x 2.5 centimeters, which the company says is the market’s smallest, fully integrated, single-board GPS compass. The new products will be available starting in March 2011 through the Hemisphere GPS Precision Products global dealer network.